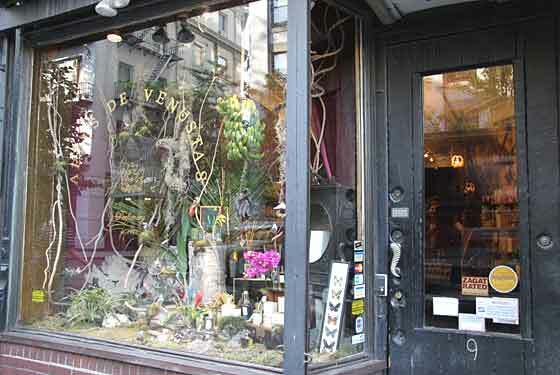 Aedes de Venustas, the New York niche perfume shop that is mecca for perfumistas, commissioned Bertrand Duchaufour to create a signature scent for them under their own brand called Aedes de Venustas Eau de Parfum. This is not to be confused with the Aedes de Venustas fragrance launched in 2009, which was done in partnership with L’Artisan. The new fragrance has garnered praise all over the perfume blososhpere – it’s just that good. It opens with a bitter citrus note that leads the way to tart, metallic, green rhubarb joined by earthy tomato leaf. The unique thing about this frag, and one of the reasons why blogs are so abuzz with its launch, is that it doesn’t really have the traditional top/heart/base linear progression. It is experienced as a full, rounded fragrance – right from the start. At its core is rhubarb and vetiver. They remain present throughout the scent, but morph as it blooms over time. On me, the rhubarb/tomato leaf accord never really disappears, but the rhubarb becomes less harsh with the addition of hazelnut and green apple. The vetiver - woody, rooty and bitter - is tempered and sweetened with honeysuckle and red berries. Incense adds a resinous darkness that somehow seems to amplify the green aspect of the rhubarb instead of weighing it down at the base as it might in a more traditional composition. Hey, I’m not a chemist and I’m not a perfumer, but I’ve smelled a lot of fragrances and I know that this is a very different architectural expression of scent and that I. Love. It. I’ve been to Aedes de Venustas in NYC many times. Opened in 1995 by owners Karl Bradl and Robert Gerstner, it’s an opulent little shop done up in deep colours, rich textures and with luxurious details – the black paper blotters with the Aedes de Venustas insignia in gold, velvet drapes, soft lighting. Aedes de Venustas Eau de Parfum is a rich opulent scent that echoes the aesthetic of the shop while at the same time declaring that there is a new and exciting future for niche perfumes and that Bradl and Gerstner have embraced that future. It’s the bridging of the old and the new that makes Aedes de Venustas Eau de Parfum gorgeous to wear - well, what else would you expect from M. Duchaufour? Now that I have it, I don’t know how I ever got along without it.